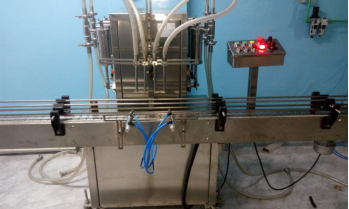 The volumetric filling machine is designed preferably with 2/4/6/8/12 heads with diving nozzle type to avoid foaming during filling process. Conveyor has inlet & outlet ends of the machine with variable speed to synchronize with the filling machine speed. The conveyor tailing width is adjustable. • Filling head height - adjustable.